Not a true spinach, but a beautiful heat loving vine grown as much for an ornamental as edible! Rich burgundy vines produce large crinkly leaves with a Swiss Chard/Spinach taste and a slight citrus bite. 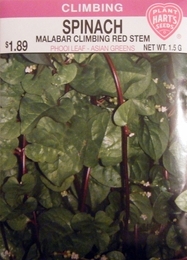 Vigorous vines can grow over 15 feet tall and cover a trellis or teepee quickly in hot weather. An Asian green known as Phooi leaf. These are fast growing vines once established and the weather warms. Supply sturdy support for the vines as soon as they are planted. Eat fresh, steam or stir fry. Planting time - Early spring or indoors 3-4 weeks earlier.